Postharvest management of staple crops, postharvest losses assessment, food safety, food value chain and value addition, crop production and crop protection. 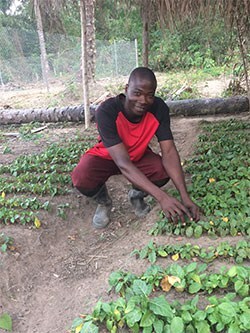 Edoh Ognakossan Kukom joined WorldVeg in November 2017 as the Production and Postharvest Specialist for the USAID-funded Mali Horticulture Scaling Project. Edoh has more than 7 years of experience in agricultural research working on postharvest management of staple crops. His research interests include participatory development, testing and transfer of innovations that focus on reducing losses and adding value along value chains of common staple foods. Prior to joining the World Vegetable Center, he was a research fellow under the RELOAD (Reduction of Postharvest Losses and Value Addition in East African Food Value Chains) project at icipe (Kenya). He also has done a variety of consultancy assignments with the Natural Resources Institutes, University of Greenwich under the African Postharvest Losses Information System (APHLIS) project. He previously worked as a research assistant in the Postharvest Management and Food Safety Department of the International Institute of Tropical Agriculture (IITA) in Benin.